Star formation within a galaxy is a complex process. We have models of galaxy formation, but one of the difficulties with these models has been that they predict a greater formation of stars in large galaxies than we observe. This would seem to indicate that there is some mechanism that hinders star formation within large galaxies. Basically at some point in the galaxy’s formation there must be something that pushes gas out of the galaxy, preventing it from forming into stellar nurseries. One proposed mechanism is the presence of supernova. Larger galaxies are more likely to have more supernova, and the tremendous luminosity of these supernova would tend to push gas out and away from the galaxy. If you do some calculations, though, you find that while that the larger the galaxy the harder it is for supernova to push gas out of the galaxy. This means that while supernova can have an effect, they can’t be the only mechanism for really large galaxies. 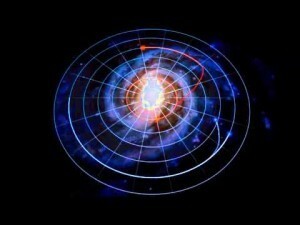 Another possibility is the central black hole of a galaxy. When these supermassive black holes consume matter, they create tremendous heat and light. Like the supernova they would tend to push gas out of the galaxy. 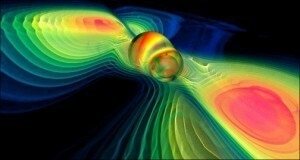 But the mass of the black hole would also tend to pull gas toward it, so that might counter the effect. Galactic black holes tend to oscillate between active and quiescent periods, so there has been a question whether the active periods produce enough heat and light to push gas away and hinder star production. A few years ago a relation between galactic black hole size and star production was presented in Nature. The team used data from the GALEX ultraviolet space telescope, which is particularly good at observing young stars in nearby galaxies. 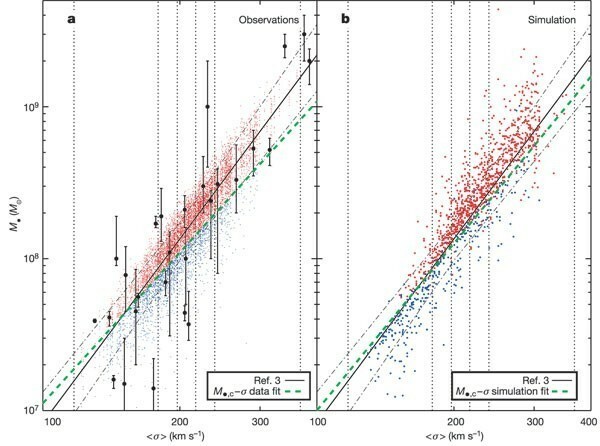 With these observations they were able to distinguish between galaxies that had significant stellar formation in the last billion years, and those that did not. They could also determine the mass of the central black hole in those galaxies using the velocity measurement I talked about yesterday. 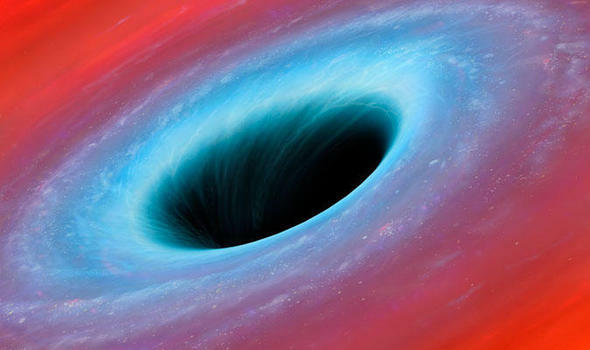 What they found was that there is a critical black hole mass for a galaxy. If the mass of the black hole is above this mass, then its active periods are intense enough to drive gas out of the galaxy and hinder star production. Below that mass it’s activity isn’t sufficient to prevent stars from forming. You can see this in the figure above. The red dots represent galaxies without recent star production, while the blue dots are galaxies with recent star production. The dotted green line is the critical mass. 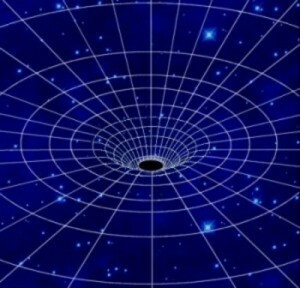 So it seems that as a galactic black hole increases in mass over time, it eventually becomes a heart of darkness. The video link isn’t available on this post.